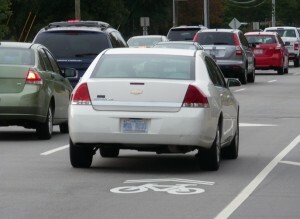 A common complaint made about the 2009 Manual on Uniform Traffic Control Devices (MUTCD) is that it provides insufficient guidance about effective lateral placement of shared lane markings (aka sharrows) and bike lanes, resulting in some DOTs installing sharrows on the right side of narrow lanes (below) or placing bike lanes and sharrows in the door zone of parallel parking. Additional excerpts from the ITE Traffic Control Devices Handbook can be seen here and here. Every traffic engineering department should have a copy of this book. Pointing traffic engineers and planners to the guidance and detailed explanations it provides is an effective way that advocates can improve the quality of facility implementation in their communities.